"You can eliminate poverty by education and the laptop is an important ingredient to that", this is the philosophy of Nicholas Negroponte, chairman of the organization 'One Laptop per Child' (OLPC). His non-profit organization distributes laptops in developing countries to children who wouldn’t otherwise have access to any form of secondary or even primary education. This is not a normal laptop, it’s a high quality machine, developed during the last forty years in the laboratories of MIT in Boston for children with no technology experience. It uses special software, created after decades of pedagogical research on the use of technology for the education of children. It costs around one hundred dollars. For A Laptop Against Poverty, OLPC allowed our cameras full access to their headquarters in Boston, to very important meetings between Nicholas Negroponte with African politicians, like the president of Rwanda, discussing the deal, the conditions and the financing for a cooperation with OLPC. 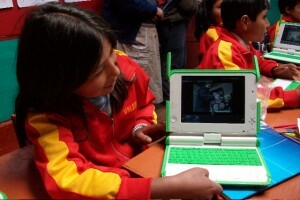 Considered by the staff of OLPC as “the best, most awesome and most beautiful documentary film on the OLPC project yet made”,A Laptop Against Poverty also shows what happens in the life of a child with no experience of technology when the computer suddenly arrives in its life. Chiara Sambuchi was born in 1975 in Pesaro/Italy. She studied Philosophy at the University of Bologna and in Berlin, as well as Classical Guitar at the music conservatory in Pesaro and Film Studies in Berkeley. She worked as an editor for the correspondent office of RAI in Berlin and has directed documentaries and reportages for numerous European broadcasters. Her films include: Nightmare Iraq, Foreign Neighbours, Locked Away, My World Has A Thousand Secrets, A Laptop Against Poverty, and Good Morning Africa!, among others.